Leading Manufacturer of reinforced kraft paper tape/water activated paper tape and kraft paper tape from Bengaluru. 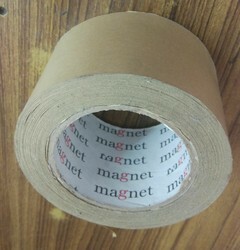 Specially designed water resistant Reinforced Kraft Paper Tape is used for carton sealing applications. Our range is best known for its durability, powerful strength, and reliability. Its gives a constant quality performance with a very strong fiberglass yarn connecting with high tensile strength sheet providing an extra margin of strength. We offer Paper Seal Tape that is acknowledged for their features such as high-temperature resistance, high adhesion on paper for safe splices through drying ovens and safe splices with any kind of release paper. These have a strong seal and holding power that makes these usable in the packing of material for the places where plastic is banned. The tapes are available in varied dimensions as specified by the clients.